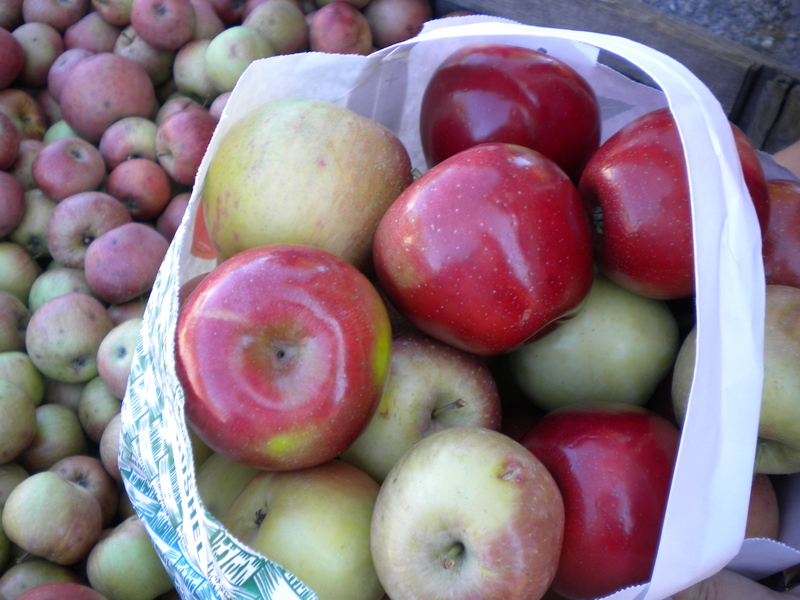 Apple Valley Harvest mmm mmm GOODNESS! 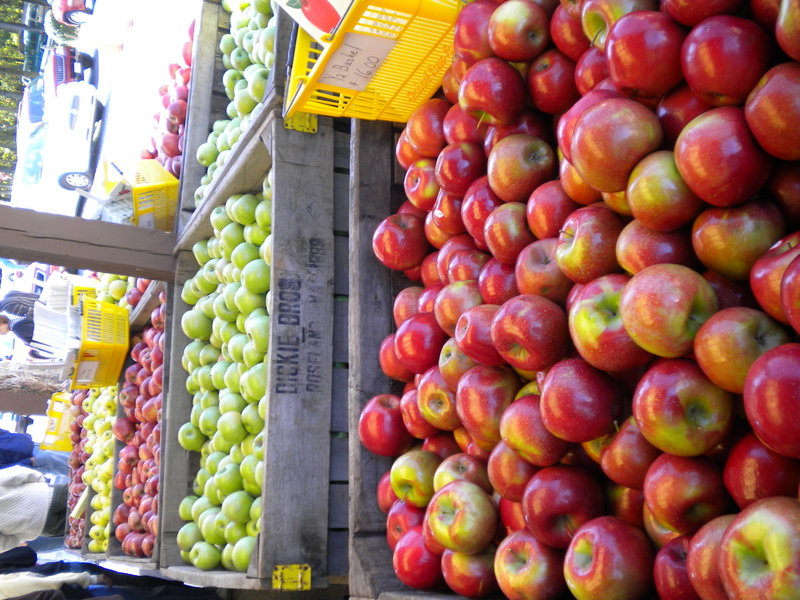 Each year in Bedford County, Virginia, on the third Saturday of October, folks from all around come to Gross’ Orchard for the Apple Valley Harvest Festival. 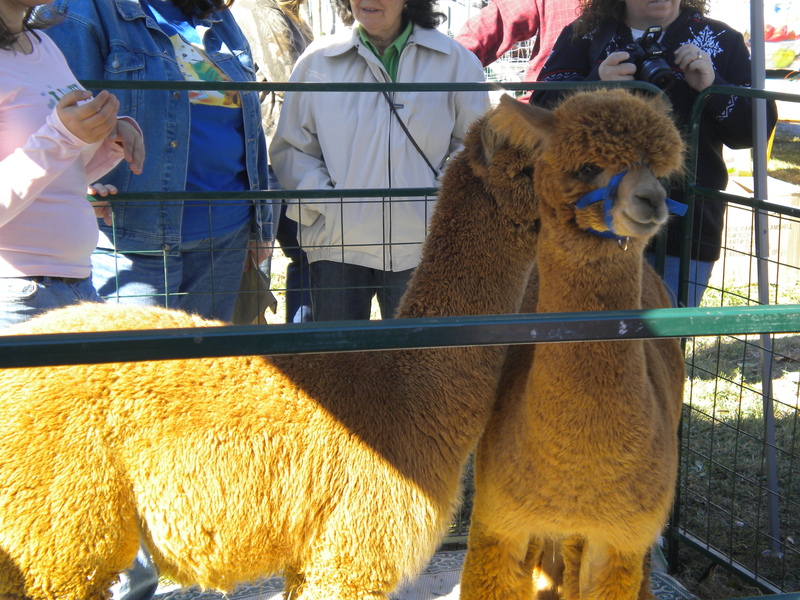 I love this little festival–which is growing bigger by the bushel. From the orchard view one looks upon the rocks at the top of Sharp Top Mountain while sampling cider, local crafts, bluegrass, pulled barbeque, and alpaca petting. 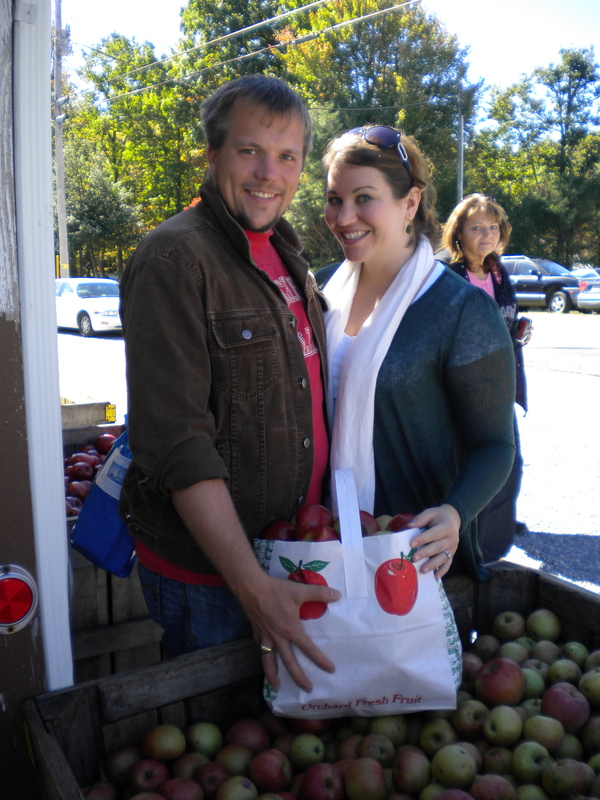 One of my best friends, the hubs, and I ventured up the mountain for some down-home fall-welcoming. After hubs decided we needed an entire bushel–if not two–of apples, I knew I would have to make something with all these fall fruits! The following is a recipe I found in a tiny little spiral-bound cookbook purchased from the orchard store several years ago, Grandma’s Best Apple Recipes. I have adapted it from the original (leaving out walnuts and adding milk, and mixing up my brown sugars for the frosting since I couldn’t decide between light and dark). PS: The icing is so good it almost didn’t make it to the cake. Enjoy! 1–Heat your oven to 350. 2. Stir together in a large bowl 3 cups a-p flour, 2 cups sugar, 1 tsp. baking soda, 1 tsp. salt, 1 1/2 tsp. cinnamon. 3–In a smaller mixing bowl, combine 3 eggs, 1 cup vegetable oil, 2 tsp. vanilla. Beat together (I used just a plain-old-fashioned rotary beater for this job.) Form a well in the dry ingredients and pour this sucker into that well, and beat it with a wooden spoon. **NOTE** The batter will be very, very thick, almost to the point of not being able to beat it without giving those jiggly triceps a right fair workout. Should this scenario arise in your kitchen, I suggest adding a tiny stream of skim milk–tiny amount, just enough so that you can loosen your grip a tad. 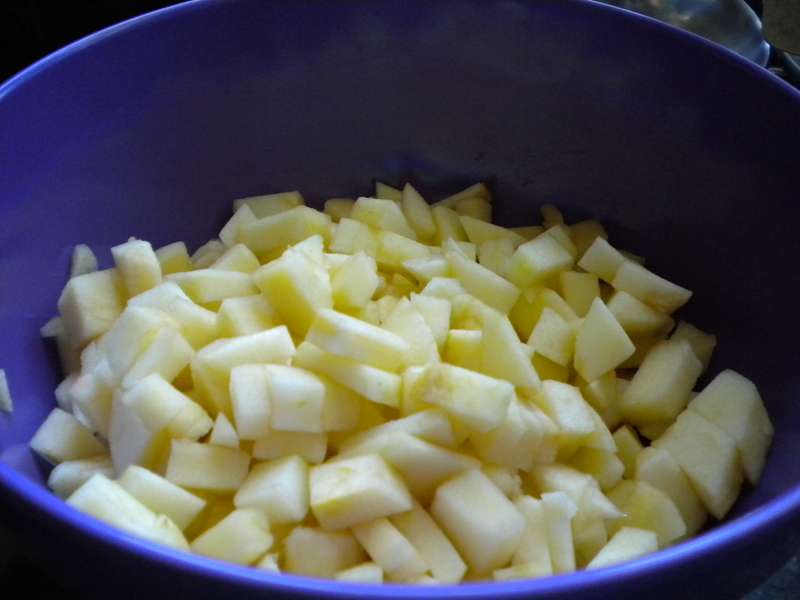 4–Add 3 cups of apples, peeled and chopped. Mix in–again, this batter will be THICK. 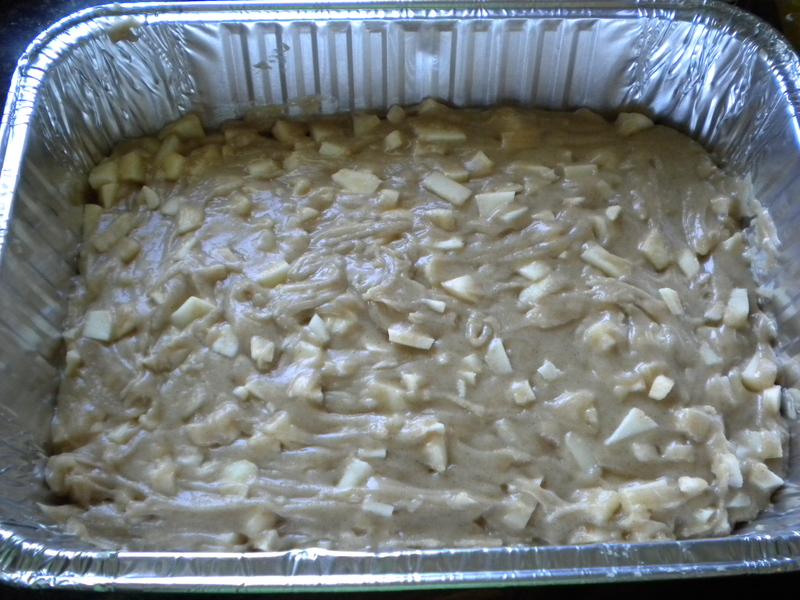 5–Pour into ungreased 9-13 pan, bake for 45 minutes, and open up your window and set your apple cake near it so all your neighbors will inhale cinnamon appley goodness in the air. And let us NOT FORGET ABOUT THE FROSTING!!!!! 1–In a saucepan, mix together 1/4 cup light brown sugar and 1/4 dark brown sugar along with 1/3 cup evaporated milk and 1/2 stick of butter. Bring to a boil and boil for 2 minutes, stirring the whole time. 2–Remove from heat and add 1 tsp. vanilla and beat in 2 1/2 cups powdered sugar. Come back tomorrow to see what we ate BEFORE dessert tonight, a dinner that is both kid-friendly and “nice enough to serve for company,” as Betty Crocker might say. Tim–I love it!!! We should so do that next year. Y’all should come up to Virginia and we can make a big day of it. Hey Cathy! I hope the sweet potatoes are tasty. I’m happy to hear that you are inspired to get back into the kitchen! So glad you are trying out the Apple Cake–do let me know how it goes for you, and what kind of apples you use. 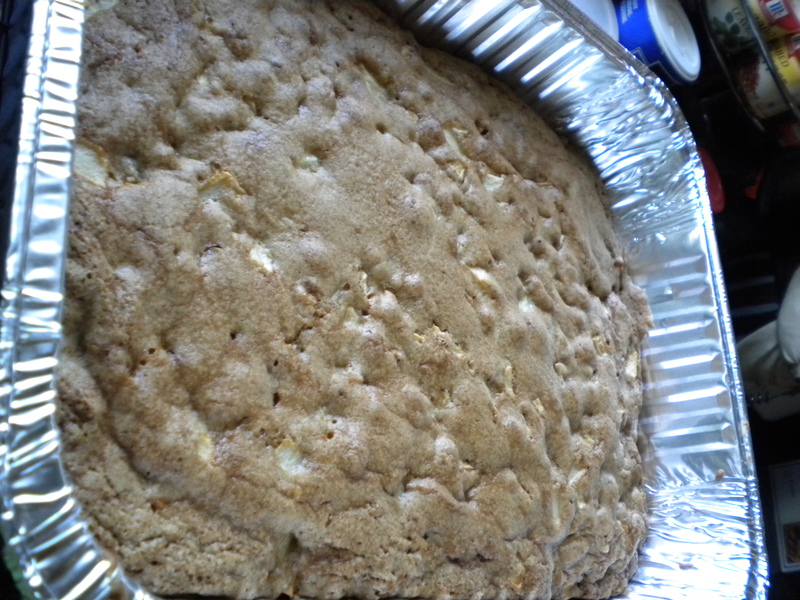 We loved it, and I’m torn between making it again because it was so good, or making something new with my apples….I’m thinking about a butterscotch apple pie or an apple-upside down cake….we’ll see soon! Thanks for stopping by. I used Fuji apples. Since I am a lazy cook, I used my kitchenaid with the dough hook. It worked great. You just have to be sure to lock that bad boy down. Potatoes passed muster too. Previous Previous post: Sweet potatoes and schnitzel cordon bleu?